Maggie Stiefvater has lingered on a precipice for the last several years between an ordinary paranormal romance novelist and a literary novelist. Her writing is always stellar, her romances sweet, and her plots heart-breakingly touching. The Scorpio Races has all of these qualities, but it goes further. It has a mixture of complex plot, well-developed characters, incredible prose, and that intangible quality that raises a novel from fiction to literature. The paranormal element to The Scorpio Races alone makes it a fascinating book: Water horses, also known as Capaill Uisce. Drawing on Celtic legends, these beautiful horses reside in the sea and are wild, vicious killers. Not knowing much about horses or about Celtic legends, it took me awhile to realize that water horses weren't real. I suppose I should be ashamed to admit that. On the other hand, Maggie's capaill uisce were so richly described that I felt as though I could feel their thick manes, smell the blood and sea around them, and see the untamed fierceness in their eyes. They might as well have been real. The entire book is reserved and mysterious. It makes for a difficult read. In fact, it's taken weeks to write this review. I needed time for the book to settle. 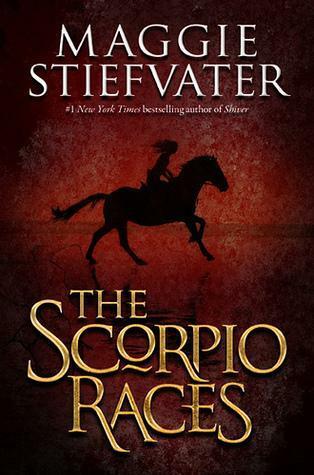 The Scorpio Races is not a book that you speed through; rather it is a book you savor and think about it. Like most literary novels, it requires effort from the reader to truly feel the book. This bothered me for much of the book. I didn't really get into it until halfway through. In that way, it reminds me very much of Jellicoe Road by Melina Marchetta. The emotions connected by the end and then the earlier parts of the book I didn't appreciate felt precious. The book is set on an island but never says where. I imagined it off the coast of Ireland - the Inis Islands, which I've been to. The time period is also indistinct. I pictured it in the 1920s or 1930s, because they had cars but otherwise it felt like it could have been set a thousand years ago. Sean and Puck are our alternating narrators. I connected to Puck first, because she is more outwardly emotive. An orphan who lives with her older and younger brother, she fears the break-up of her family more than anything. She is passionate without being whiny, brave without being reckless, quiet but not shy. Sean was harder to get to know but he became my favorite character. He is reserved, saying little. But it's soon obvious that a multitude of emotions bubble just below the surface. Sean is not afraid to speak; rather, he doesn't feel the need. The few words he does say are powerful and direct. He has the self-confidence from knowing that he's the best at what he does. More than anything else though, he loves horses, especially the water-horse he rides but does not own, Corr. He and Corr are one being, neither complete without the other. I love how Sean and Puck's relationship builds. It is a romance, but not the kind we're used to reading. It starts from confusion and curiosity, building to reluctant friendship, and ending in deep trust and respect. By the end of The Scorpio Races, the depth of Sean and Puck's relationship hit me like a bowling ball despite no great outpouring of lovesick dialogue. I had been shown why they are soulmates not told. Not only that, but I have grown to love both Sean and Puck individuals. Each character's personal trials and triumphs are no less important than their relationship. As I mentioned before, Maggie's writing is stellar. The prose of each of her books is slightly different in the images and emotions they evoke. Somehow the words she chose and the way she structured her sentences made me see the colors blue, brown, and white - the colors of the sea and beach; I heard silence broken only by waves crashing against rocks; I smelled the sea air; I felt cold air and strong winds. I find the beach and sea to be isolating and reserved, ordinary silent and still but capable of terrific destruction with hardly a moment's notice - much like the horses and characters of this novel. Maggie's prose captured this perfectly. If I could change anything about The Scorpio Races, I would want it to be a little easier and faster to connect to emotionally. But it would not be the quality book that it is without its difficulty. I respect the slow growth and ultimately love the story and the character more for it. I've just started reading this one and though I haven't read The Wolves of Mercy Falls series, I can already tell that I'm going to thoroughly enjoy this. I was sooooo in love with this book! Enjoyed it far more than the Shiver series! *gasps* Great review! Yeah this was a slow moving book and very light on the romance but I found it to be a horse love story :) Yeah this book made up the ending of forever and I disliked. I will have to remember your review when I read this book, because I'm very quick to DNF a book if it's not grabbing me. I love the way you describe the development of their relationship. Fabulous review! I'm waiting for a good chunk of time to slowly read and absorb this book. I agree that is sounds much more complex and completely different from the Wolves of Mercy series. Maggie's writing is beautiful and I'll pretty much read anything by her. "By the end of The Scorpio Races, the depth of Sean and Puck's relationship hit me like a bowling ball despite no great outpouring of lovesick dialogue." YES!!! That was one of my favorite things about this one, the fact that their relationship felt so intense with hardly anything being said at all. I just loved this book, I'm so glad you loved it too Alison! Yikes, I almost feel like shuddering because it took me several attempts to get through JR, so knowing that this one is set up in a similar context is rather perplexing. I never like to think of reading as 'work'. Still, I love Stiefvater writing style. It's very literary without being overwhelming. Thanks for the beautiful review, Alison. It certainly didn't seem like one that took you weeks to write. Pretty much perfect review Alison, well worth you spending several weeks writing it! I totally agree that Maggie is on the border of literary fiction, and I think this is her most literary novel to date. It definitely does take a while to emotionally connect-it's not an easy read to begin with, I didn't actually like Puck for a while! If you stick with it though it is super rewarding! Totally agree about Puck and Sean's relationship too..I really really enjoyed this and I'm so glad you did too. Thanks for the great review! I look forward to reading this one! My copy arrived a couple of weeks ago--so looking forward to reading it. I love reading how others felt about this book - we're all so different in our reading tastes, style, and likes/dislikes! You picked out one thing I thoroughly agree with, though - the prose in this is truly fantastic, literary-fiction grade stuff. It's what pulled me in and made me stay, even though I haven't been a Stiefvater fan in the past. Since now it is to become a movie I must read this book. I am the type to read the book before the movie person. Loved the review! Wow, I think yours is the best review I've seen yet. So eloquent! I didn't realize how much of a difficult read this might be, but I'm glad for your disclosure and that you still gave it five stars. I recently won this so I hope to get to it soon. Thanks for the stellar review. Love this series by Maggie Stiefvater!! Each character draws you in!! Very interesting concept... Dream thieving . And also Blue's family is the best! !